Celebrate International Women’s Day, March 8 with a feast of words and ideas from acclaimed authors Kirsten Tranter, Tara Moss and Claire Corbett, with blogger Elizabeth Lhuede, in a discussion sponsored by The Stella Prize, a new annual award for women’s writing. When: 6 – 7:30 pm, Thursday March 8. Cost: FREE. All welcome. Please RSVP. 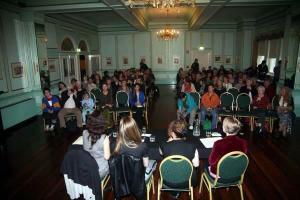 Love this photo of the event in the gorgeous Carrington Ballroom. I said it would be glamorous. Eau-de-nil walls, gold trim, chandelier, and so many people they had to bring in extra chairs.